About the authors: Grace was presented with the IFAW Animal Action Award for Conservation in 2012; IOSF was Wildlife Conservation Award Winner, British Animal Honours, 2013. Paul has worked on many TV and radio programmes including Wildlife on One, The One Show, Animal Hospital and Blue Peter and they have both had various articles and books published. Having worked for over 20 years on otter conservation of all 13 species, the authors wished to share their experiences of these beautiful animals. People may be familiar with the Asian small-clawed otters, often found in zoos, or the sea otter, well-known for lying on its back cracking open shells, but may not be aware that there are more fascinating species. It is hoped the book will increase public support for the work of the IOSF (International Otter Survival Fund) and awareness of the terrible plight of otters which in many countries are on the verge of extinction. Each species is listed in the IUCN Red Data List and yet little attention is given to their predicament. The illegal wildlife trade in otters is huge – not just for furs and body parts but as pets. In some parts of the world otters are disappearing rapidly and unless urgent action is taken they will be gone forever. The Hairy-Nosed Otter was thought to be extinct in 1998 but funds provided by the IOSF led to a survey in southern Thailand where a small population was found. Since then populations have been found in Vietnam, Cambodia and Sumatra, but these are small and very fragile. This type of conservation work is vital because so often the plight of otters is overlooked for other high profile species such as tigers and elephants. Otters stand at the top of the food chain on both land and water so they are an ideal indicator of a healthy environment. With greater awareness and support the IOSF will be able to do more on the world stage to conserve otters – PROCEEDS FROM THE SALE OF THIS BOOK WILL GO TO THE IOSF. Otters of the World is an introduction to the magical world of otters and is complemented with many wonderful photos, with distribution maps for each species. 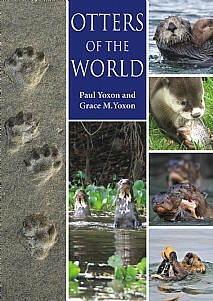 An essential and unmissable read for anyone interested in nature, wildlife, conservation and especially otters.